When it comes to making smoothies, I always throw a few spices into the blender. 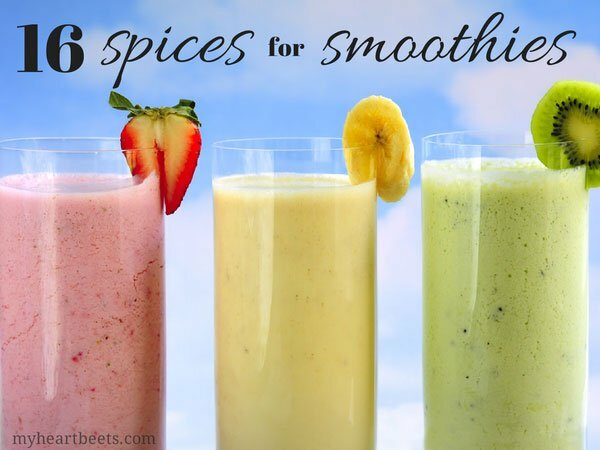 Spices have been used for thousands of years for their healing powers and adding a pinch to a smoothie is an easy and tasty way to add some extra health benefits to your diet. Below is a list of 16 spices for smoothies. Also in this post, I’ve included some of my smoothie making tips as well as options for dairy-free milk. Enjoy – and let me know what spice is your favorite! Cardamom is my favorite spice. I use it in everything sweet and savory. It has a warm, floral-like flavor and is very aromatic. I always buy cardamom pods and remove the seeds myself, because the powdered cardamom that you get in stores just isn’t as flavorful. Turmeric has a slight peppery flavor, but when used in small quantities in a smoothie, the taste isn’t noticeable. This spice is known for its anti-inflammatory properties and has traditionally been used as a natural painkiller. I love adding freshly grated turmeric root to my smoothies but if you can’t find turmeric root, just add a pinch of powder. Did you know that cloves are dried flower buds? They have a sweet and warm aroma, perfect for savory dishes as well as fruity ones (making them a great choice for smoothies). Traditionally, this spice has been used as a healing remedy for toothaches and is also known to fight inflammation. Cumin, a member of the parsley family, and has an earthy, almost smoky flavor to it. Cumin is often used when making an Indian spiced yogurt called raita and so it’s surprisingly tasty when used in smoothies that call for yogurt. Use this spice to make yourself a savory smoothie, perfect for a lunchtime meal or an afternoon snack. I love adding a pinch of freshly grated nutmeg to my smoothies. Nutmeg has a rich, earthy, nutty flavor. Don’t use too much of the spice though, as it can make you nauseous. Cinnamon, a sweet and comforting spice, is known to be an energy booster and has shown to regular blood sugar. I find that using the spice makes things taste sweeter than they are. I love using cinnamon in coffee flavored smoothies or in green smoothies. Saffron, one of the most expensive spices on the market, requires just a pinch to impart flavor and its beautiful golden color onto any dish. You can use this spice when you’re in the mood for a regal smoothie. 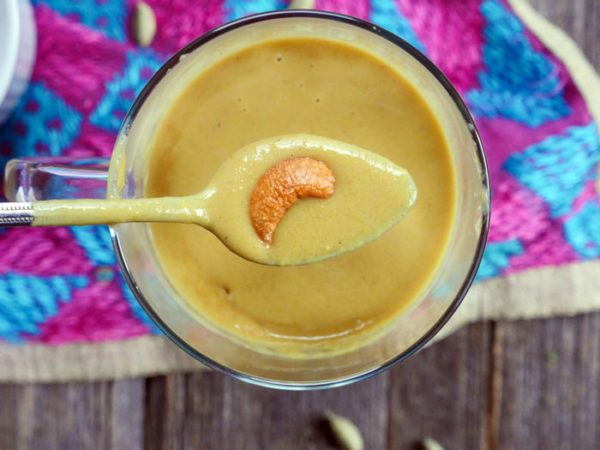 Soak a couple threads of saffron in a tablespoon of water and then add that to your blender along with the rest of your ingredients. Fennel seeds have a sweet, licorice type flavor. In Indian restaurants, you’ll almost always find a bowl of candy-coated fennel seeds by the door. That’s because fennel seeds are typically eaten after a meal to help aid digestion. This spice is also often used in making Indian desserts. A pinch of freshly ground fennel powder goes very well with fruity smoothies. I love the flavor that a pinch of freshly grated ginger adds to smoothies. Truthfully, I like using ginger in just about anything. It’s said to help with nausea and known for its anti-inflammatory properties. I suggest freezing ginger and using a microplane to add it to your smoothies. I use the herb (fenugreek leaves) more often than I use the spice (fenugreek seeds) but you can use both when making smoothies. If you use the seeds, lightly roast them before you grind them to help rid some of their bitterness. Fenugreek has been used as an alternative medicine for helping increase breast milk supply, however it’s not suggested for consumption while pregnant – something to talk to your OB about if you’re expecting. When it comes to spices, it seems like everyone forgets about allspice. Even though allspice looks like a peppercorn, it tastes like a combination of nutmeg, clove and cinnamon. It’s a package deal all wrapped in one little bundle. It’s mild in flavor and works well in both sweet and savory recipes. A pinch of cayenne pepper can help bring out the flavor in other ingredients and when used in a small amount, you shouldn’t feel the heat. Cayenne is said to help stimulate metabolism and can possibly suppress appetite. This spice is a star (literally… it looks like a star). It has a sweet, licorice-like flavor and is often used in both sweet and savory recipes. 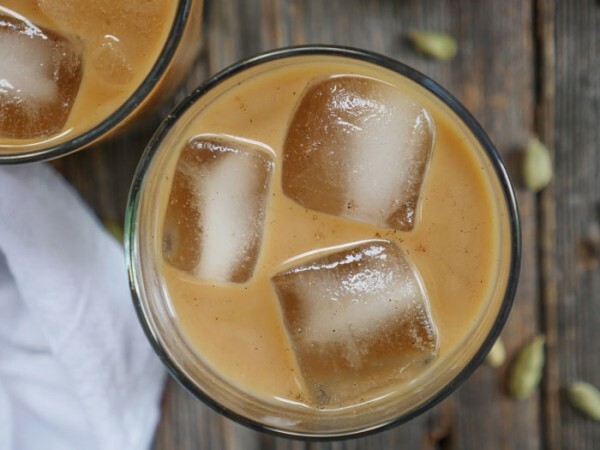 Star anise pairs well with citrus and other fruits, making it a good choice for smoothies. It’s not very common to see freshly ground black peppercorn in a sweet/dessert recipe, but it does happen. Freshly ground black pepper has a sharp bite and it also enhances the flavor of other ingredients in a recipe. If you’re getting bored with your smoothies, try adding a small pinch of black pepper for something a little different. You can also use pink peppercorns for a milder flavor. Unlike cilantro, coriander seeds are very mild in flavor. Even if you’re a cilantro hater, give coriander a chance. The seed’s flavor is sweet, nutty with subtle notes of lemon. While there are plenty of cilantro smoothies out there, I personally would rather use the seed in a smoothie. Vanilla is anything but boring, especially when you’re using the real thing. This spice (yep, it’s considered a spice) enhances smoothies and adds a touch of sweetness to any recipe. Use whole spices: freshly ground spices provide the most flavor. You can use a microplane or a coffee grinder to freshly grate or grind whole spices for maximum flavor. Add a little fat: adding some avocado, a spoonful of nut butter, or leftover coconut milk will help keep you full. Freeze Fruit: for a colder, smoother smoothie. Plus, this way you can use less ice which means a less diluted drink. Plus, it’s a great way to use overripe fruit. Enjoy making smoothies – let us know what combinations you try! I know this is an old post, but boy I am so glad I found it. I use Ginger in just about everything too and was looking for more spices to add to my smoothies. Off to buy some Saffron as the health benefits are excellent I believe. Thanks for the great information which will be well used! I am so delighted about this article. I am currently changing my diet and have been doing green smoothies for the past two weeks and I feel the difference already. I was able to quit coffee without any headaches. I feel my energetic than I was with coffee. I also suffer from hypothyroidism so I am only using spinach and dandelion greens besides a little bit of fruit. As far as spices, I have been using cinnamon, ginger, clove and coriander. I also soak up some raisins or prunes overnight to add to the smoothie the following morning. Works great! Less hunger. I have been drinking this for breakfast and I do not get hungry until about lunch time. However, I drink lots of water in between. Happy smoothing! 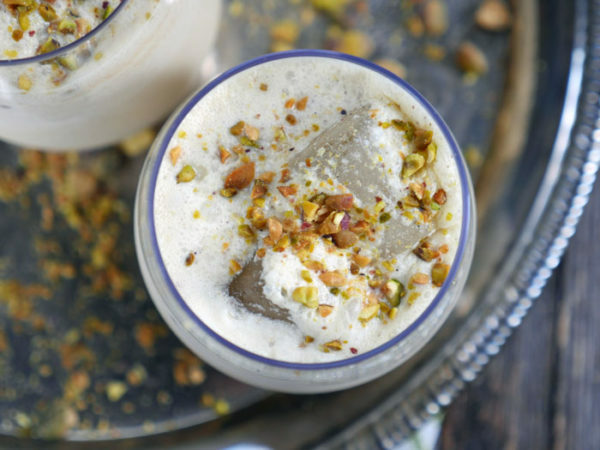 Can the star anise and fennel seeds be used interchangeably in making smoothies? I think that the flavor of them is the same.